The Handbook of Clinical Techniques in Pediatric Dentistry provides the clinician with an increased level of expertise and skills for timely identification and intervention for various presentations in the developing dentition. It also clearly describes procedures for treatment in the primary and young permanent dentitions, including pulp therapy for primary and young permanent molars, extractions, space maintenance, and more. The most commonly encountered treatment needs are discussed with the goal of increasing clinician and staff confidence while decreasing chair-time and stress. 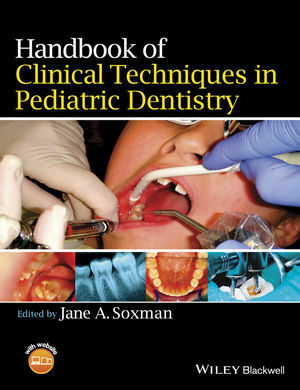 With an emphasis on practical instruction, The Handbook of Clinical Techniques in Pediatric Dentistry is ideal for pediatric and general dentists, pediatric residents, and dental students taking clinical pediatric courses. Jane A. Soxman, DDS, is a Diplomate of the American Board of Pediatric Dentistry and a member of the American College of Dentists. She is a seminar instructor in the general practice dental residency at Allegheny General Hospital Division of Dental Medicine and general practice dental residency educational consultant at the Veterans Affairs Pittsburgh Health Care System. She serves as Pediatrics Advisor on the Advisory Board, column contributor and manuscript reviewer for General Dentistry journal and maintains a private practice limited to pediatrics in Allison Park, Pennsylvania.